The Palaung (Burmese: ပလောင် လူမျိုး [pəlàʊɴ lùmjó]; Thai: ปะหล่อง, also written as Benglong Palong) or Ta'ang are a Mon–Khmer ethnic minority found in Shan State of Burma, Yunnan Province of China and Northern Thailand. In China, they are referred to as the De'ang (Chinese: 德昂族; pinyin: Déáng Zú also spelt Deang) people. A Ta'ang tribal woman near Kalaw, Shan State, Burma. A Burmese depiction of the Palaung in the early 1900s. They live mainly in the northern parts of Shan State in the Pa Laung Self-Administered Zone, with the capital at Namhsan. The Ta'ang (Palaung) State Liberation Army, the armed wing of the Palaung ethnic group, began fighting against the Burmese military in 1963. It entered a cease-fire agreement with the central government in April 1991, but is currently continuing the insurgency. Both the government and the rebel armies have derived benefit from poppy cultivation, which has caused serious drug addiction among the local people. 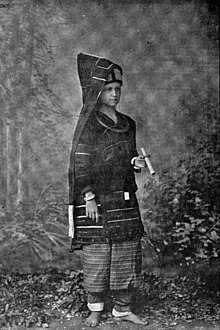 Palaung woman in British Burma. There are three main subgroups of Ta'ang: the Palé, Shwe and Rumai. The Chinese government groups together the Palé, Riang, Rumai and Shwe peoples as the De'ang ethnic nationality. The group also includes the Danau (Danaw) who may no longer have a separate identity from the Palé. There are three principal Palaung languages. In China, the De'ang are found in the following villages of Zhenkang County and Gengma County. In China, they are known as the Laopulao 牢普劳; there are 6 other De'ang groups located in Burma. Most Ta'ang are adherents of Theravada Buddhism and Buddhist temples can be found in most of their towns. Buddhism is present in all of the daily activities of this ethnic group. At the age of 10, many children are sent to the monasteries, primarily for education. Most of them return to lay life in later years. The Riang are the only one of the four groups who have never converted to Buddhism. The majority of the Riang are animists. Cameron, A. A. (1912). Notes on the Palaung of the Kodaung Hill tracts of Mong Mit State. Rangoon: Govt. Printer. Milne, Mrs. Leslie. The Home of an Eastern Clan: A Study of the Palaungs of the Shan State, Oxford, Clarendon Press (1924). ^ a b 中国少数民族社会历史调查资料丛刊》修订编辑委员会. 2009. 德昂族社会历史调查, p.94. Beijing: Minzu Chubanshe.